One of the best and important tools on Windows is the Task Manager. 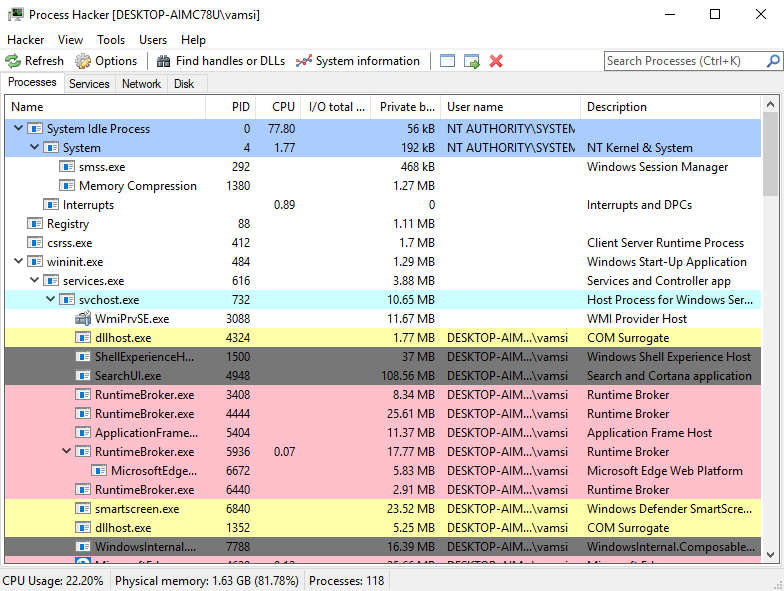 Almost every Windows user makes use of the Task Manager one time or the other to monitor their system resources, manage processes and kill unresponsive applications. 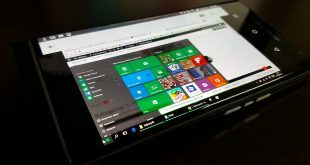 As good as it is, there are far better tools on the internet that give you better information and control while putting the built-in task manager to shame. Without ado, here are some of the best task manager alternatives. 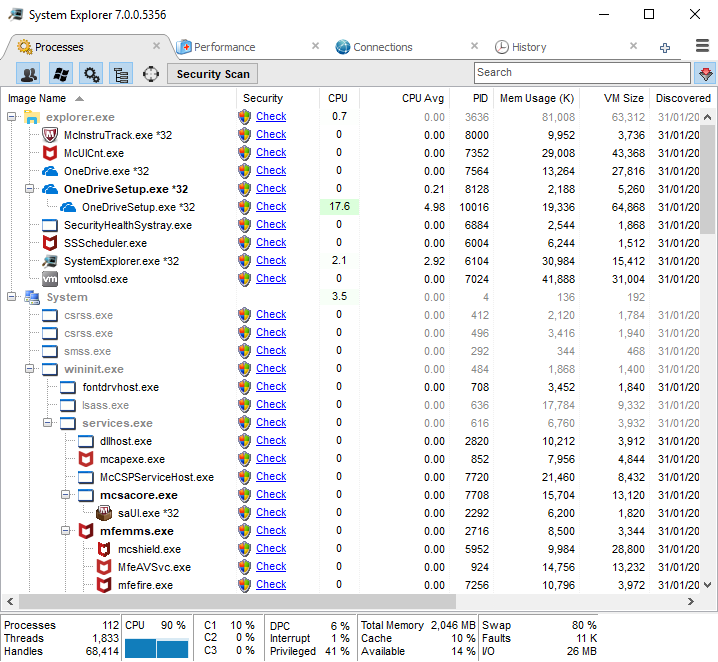 System Explorer is one of the most powerful and lightweight task manager alternatives for Windows. What makes System Explorer special is that it gives you detailed information about all the running processes and services. Additionally, using the quick toggles provided on the top navigation bar, you can see specific processes or services related to the Windows system and users. If need be, you can also perform a security scan on all your process. When you do that, System Explorer will verify all your running processes against its own security database to find any malicious or bad actors. Off all the features System Explorer has, one of the interesting ones is the History tab where it tracks and stores all the process activity like network connections, command executions, etc. Additionally, the user interface is neatly divided into separate tabs out of the box. When in need, you can add your own custom tab by clicking on the “+”. Of course, being a good task manager alternative, you can do regular things like changing process priority, affinity, ending problematic processes, suspending or restarting processes, etc. 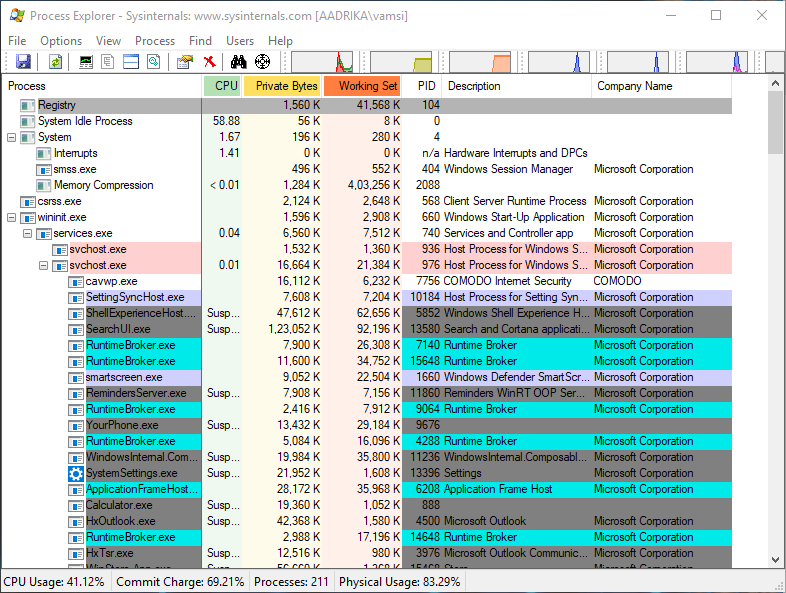 If you are looking for a powerful Windows task manager alternative which gives you access to a ton of data then System Explorer is for you. Process Explorer is one of those tools every Windows user should have in their software repository. In case you don’t know, Process Explorer is part of the SysInternals suite and is officially supported by Microsoft. You can think of Process Explorer as Task Manager on steroids. When using process explorer, you get a wealth of information about every process. 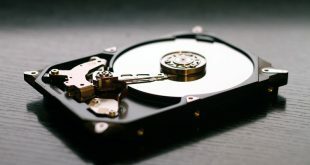 That information includes but not limited to CPU usage and history, context switches and switch delta, CPU cycles, process timeline, the process I/O, network usage, disk usage, etc. Two of best features of Process Explorer is that you can verify the process signatures and when needed, you can scan all the processes with Virus Total, an online anti-virus scan engine that uses more than 50 different antivirus software in the background. Other features of the application include the ability set it as the default application for task manager, ability to set process priority and affinity, ability to kill a process or entire process tree, ability to create a process dump, fully customizable user interface and the ability to find the handle or DLL of a specific process. 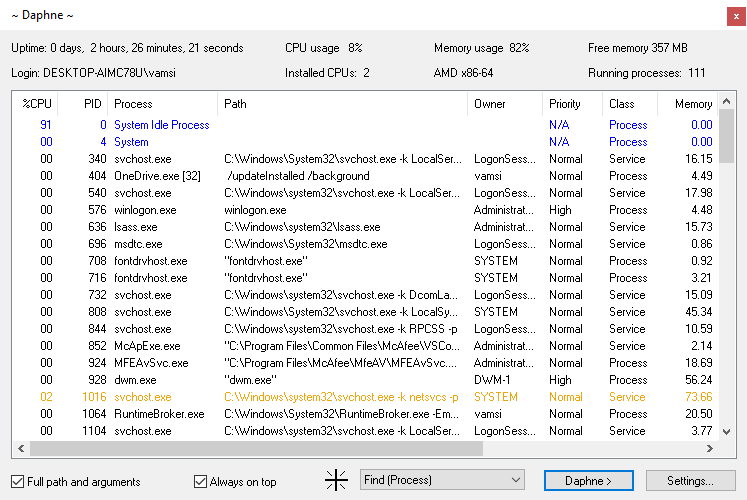 If you are looking for an effective task manager alternative that is not only supported by Microsoft but is loved by most Windows developers and power users, then do try Process Explorer. Also, did I mention that Process Explorer is portable? Yes, it can run without installation. Process Hacker is very similar to Process Explorer. However, the user interface of Process Hacker is a bit cleaner and has all the necessary options a just a mouse-click away rather than buried deep in various menus. One of the interesting features of Process Hacker is its find window and find window thread options which help you find the process based on the opened window on your desktop. This feature is very useful when you cannot find the process of a particular application. If you want to, you can also find the linked handlers and DLLs of any process by clicking on the Find handles and DLLs button in the navigation bar. Additionally, you can get detailed information about any executable by selecting the “Tools -> Inspect executable file” options. Apart from showing you a ton of details related processes, Process Hacker also gives you access to services, disk, and network usage. All in all, other than the lack of virus scan and signature verification, Process Hacker is a pretty good task manager alternative. If you are looking for a simple task manager alternative that is easy to use and beginner friendly, then Daphne is for you. Though the user interface looks dated, it works perfectly fine and gets the job done. Being a simple and straightforward application, Daphne is not as powerful as the above applications but has the necessary features you would expect from a task manager. Those features include but not limited to process color coding, killing, suspending, and restarting processes, the ability to look for suspicious processes, set process affinity and priority, etc. Off all the features in Daphne, I really like the ability to create a schedule to kill any process you want. In fact, you can set a timeframe so that Daphne automatically kills the target process as soon as it starts within that timeframe. Additionally, you can create traps for certain process and gather information regarding their activity or kill them. Task Manager is not all about killing, suspending, or restarting process and services. One of the major functions for a good task manager is to show system resources at a glance. Moo0 System Monitor is exactly that. 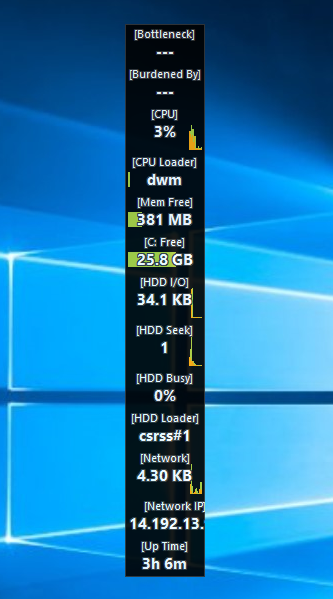 Using a desktop widget, Moo0 System Monitor shows a variety of information like the CPU usage, CPU temperature, GPU usage, GPU temperature, power usage, disk I/O, network usage, memory usage, etc. Of course, you can customize the desktop widget to show only the information you need. If you are looking for a good task manager alternative that shows extensive information about your system resources and don’t mind the lack of the ability to see or kill a process, do give Moo0 System Monitor a try. MiTeC Task Manager is very similar to Process Explorer in that it is feature-rich and portable. In fact, the MiTeC Task Manager has a better user interface with good usability compared to any other app on this list. I might even dare to say it is a tad bit better than the already awesome Process Explorer. 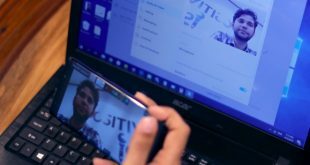 MiTeC gives you access to some additional and interesting features like machine journal, ability to see opened and locked files, running or opened sessions, autoruns, etc. Also, there is this feature called Desktop Explorer that gives you a mountain of information about any application or window by just selecting it with your mouse. One of the things I really like about MiTeC is that all the features and information are neatly divided into their own sections so that it is very easy to find what you are looking for. Add to that, considering how much information and control it gives, MiTeC is pretty fast and responsive. Simply put, I personally loved using MiTeC task manager and it even earned a place in my software repository. So, give it a try and see how it works for you. Best Windows Task Manager alternatives? Overall, there is no such thing as the best Windows Task Manager alternative. Each one of these task managers has unique features and that the others do not. You need to look for the one best suited for your needs. For example, Process Explorer can verify the process signatures. System Explorer can create system snapshots and you can compare them etc. That’s it for now. If you think I missed any of your favorite task manager alternatives, then comment below and share them with me.